Let’s take a look at people who are interested in engaging with Nike Basketball, how do they live their lives, what do they enjoy and what gets their mojo up! Young adult males dominate Nike Basketball audience, as we see 79% of the group is male and the 61% of the audience is between 24 to 35 of ages. 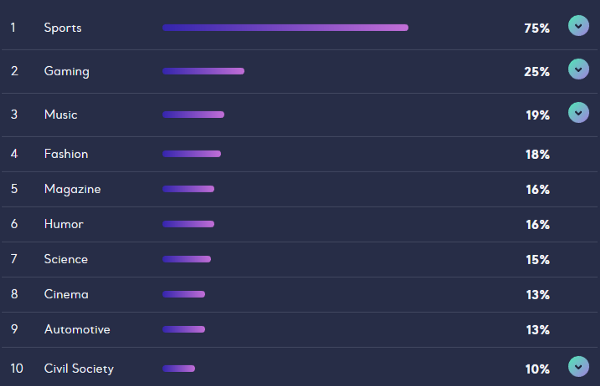 We have prepared our analysis with the data from the last quarter of this audience. These males have a high interest in Sports, besides basketball, they are into a variety of branches like Football, Volleyball, Tennis and Handball. However, their celebrity engagements show us how special basketball is for them. 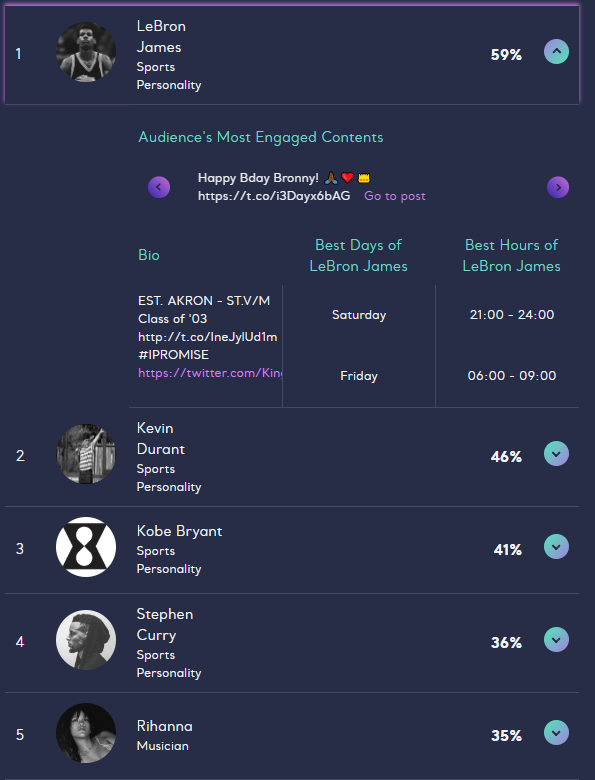 Their most engaged category is Sports Personalities with 38% and their top 4 is composed all by basketball players like LeBron James and Kevin Durant. They are keeping close track with their favorite players and are eager to see more. They also like to embed sports interest in their daily lives with their clothes and accessories, as their most engaged brands are Sport and Sportswear category with 23%. 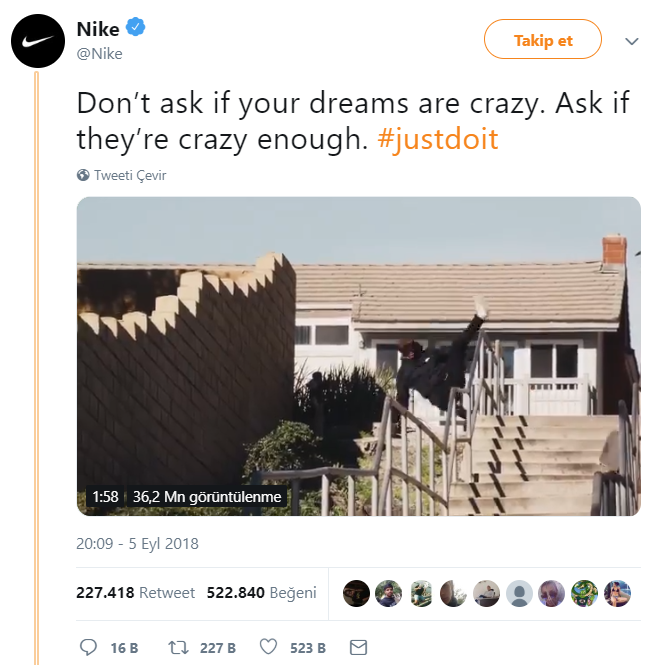 Not a surprise that their most engaged brand is Nike, however it is intriguing to see that the contents they have engaged with are dominated by motivational themes and dreams. This tells us that the brand achieves to make an emotional bond with this audience and able to represent much more than a fashion trend for them. They care about what Nike got to say, they get motivated by it and enjoy the process. It is a well known fact that Nike and Adidas have their own devoted buyers, however it is also a common case where buyers prefer both brands in their closets. The brand engagements of Nike Basketball audience confirm this insight, as their second most engaged brand is Adidas with 49%. Yet, we see a clear distinction when we compare the contents they have engaged with them. As mentioned above, beyond the prestige and functionality of the brand, these males are bonding with Nike on social media. Adidas, on the other hand, have attracted these users mostly for the products they produce like Yeezy Boost 350 or the Champions League official match ball. Therefore, it is safe to say that Nike has a special place in the heart of these users, but Adidas also has a prominent place in their lives from different reasons and motivations. Apart from the above two, Puma and Under Armour stick out from their brand list. Especially females seem to like Puma and BTS collection “Made By BTS”. Under Armour, on the other hand, shines out for its’ collaboration with basketball players like Stephen Curry and Joel Embiid. Nike Basketball audience’s celebrity tendencies show a great deal of Pop and R&B musicians. While we observe that women singers dominate the list, the audience is interested in more than the music aspect. Lady Gaga’s new movie with Bradley Cooper; A Star Is Born have been in their radar. They have engaged with Gaga’s many posts about the movie and the premiere. In addition, we can tell from their engaged contents with Drake that they enjoy witnessing the friendship between Drake and LeBron James on social media. A cooperation of the two would attract their attention. Another important aspect in these males’ lives, without a doubt, is Gaming. Came in the second place in interests with 28%, boy they do enjoy computer games! 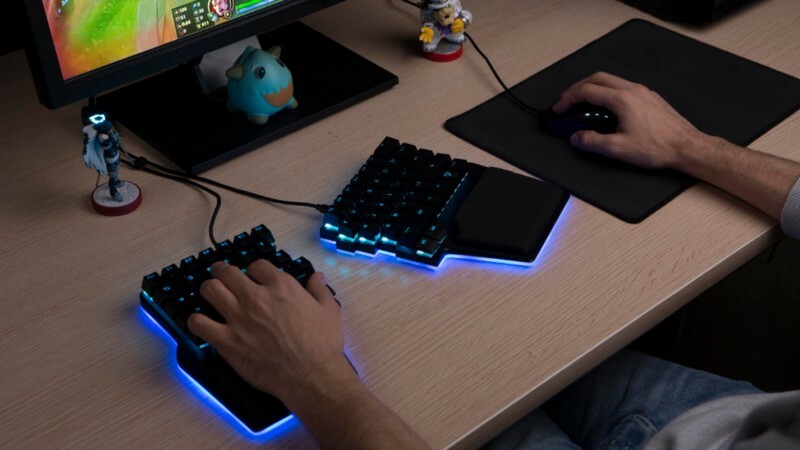 They are following gaming accounts like Fortnite and engage with producers like Rock Star Games. As we see PlayStation and Xbox in their top 5 most engaged brands, we can say that computers are only a small part of their gaming family. When it comes to the traditional media like TV and Radio, Nike Basketball audience is not much interested in associating themselves with these means on social media. The small group of 27% who does, mostly cares for Action & Adventure and Drama genres. Game of Thrones and The Tonight Show are on the top of the list and their most active days for their engagement is Thursday. 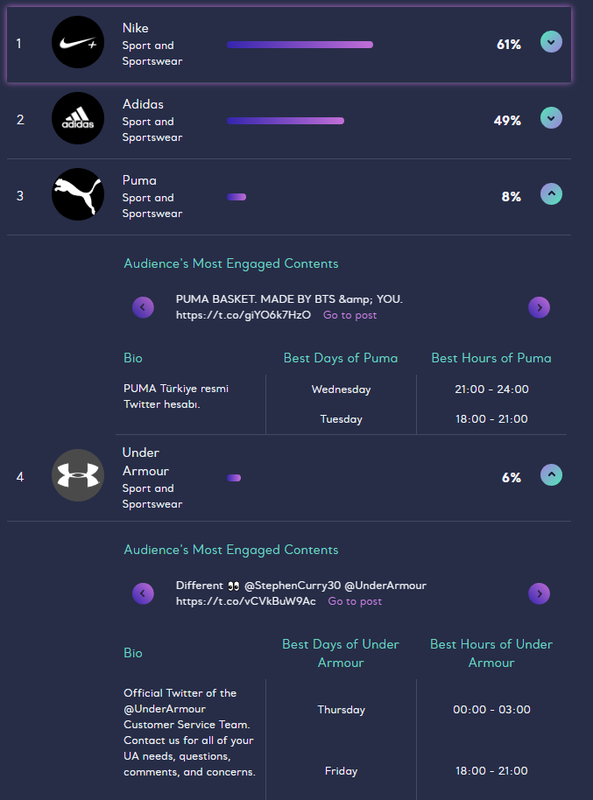 It is easy to see with our tool that how sport interest spread across the lives of Nike Basketball audience from variety of channels. 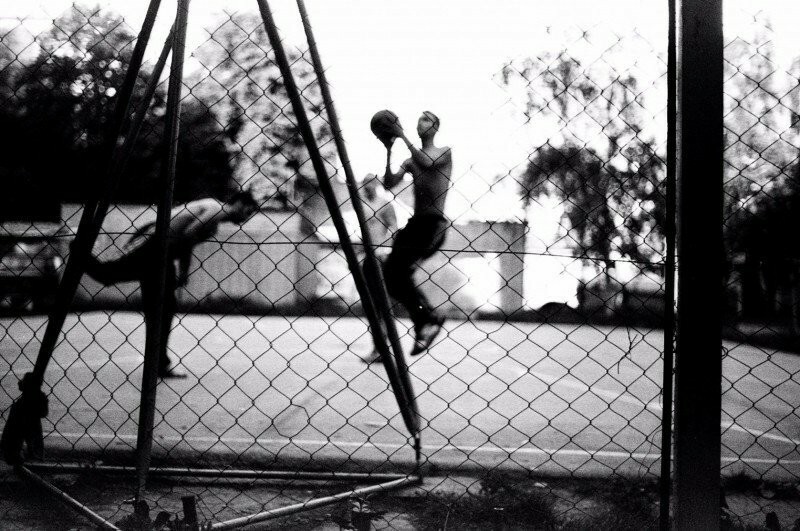 More than a hobby, sports and especially basketball is a way of life, a culture code for them. In their daily routines, they are reading related magazines or watching sports news and talking about the games amongst each other. They engage with their favorite players, checking out the new models in sportswear and care about the latest trends.